This exciting series from Microgaming has added another recent title that is known as the Turbo Max Power slot machine. Much like its counterparts, this one also features three reels and five paylines that are tied to a progressive jackpot. Classic symbols like grapes, sevens, jokers, lemons, and melons grace your screen in traditional fruit machine style, but there is much more going on here than meets the eye. 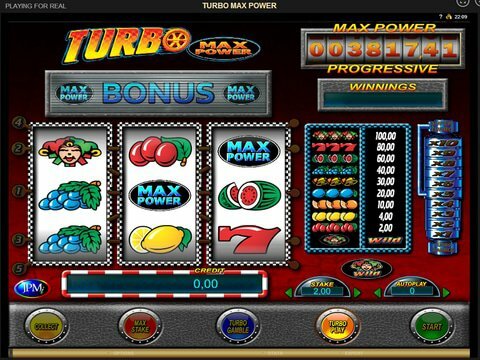 To check it out for yourself in a demo with no download and no registration required, you can try the Turbo Max Power free play slot that is located right here on this page. Real money play is available at Jackpot City Casino where you can grab a 100% match of your first deposit that is worth up to $500. This review found that there is currently no mobile version available. As far as these classics go, this one provides quite a betting range that starts at just a quarter and climbs up to $10.00 per spin. The maximum in-game non-progressive win is $250, but since it is tied to all of the other Max Power titles in the Microgaming network, it is also possible to win thousands of dollars at once. The Joker acts as the wild in this title (although this is unusual for three-reel machines) so it can help you create more winning combinations. After each win, you have the option to use the Gamble feature to double your winnings. There is a meter at the top of the game that increases or decreases as you win and lose with this option, but if you manage to fill it up completely, you will trigger what is known as the Super Turbo Gamble option. With it, you can double your prize or gamble half and this ends the feature. If you win, you get the maximum jackpot or only half. Another great feature associated with this title is the Turbo Max Power slot game bonus that occurs whenever you get three of the corresponding symbols on any of the five paylines. When this happens, the progressive jackpot is yours! It varies in value based upon the length of time since it was last hit and the number of people who have contributed, but it is always quite sizeable and well worth the initial wager. Canadian gamblers are sure to love the thrills!